To Feel Your Best - Stop and Rest at 20th Century Touritst Cottages, Highways 61-63-64-70-79, West Memphis, Ark. 22 Cabins - Air Conditioned -Circulating Hot Air Heat. "Pop" Phillips, Partner and Mgr. Phone 167. Provenance: Gift of L&TM5K regular Elaine, who defaced the card front with the "No Good lie" inscription several years back. Gee, I don't find this one boring. It's a study in pre-photoshop photoshop. Or is it a painting? A backdrop on fake grass? Well, consternation! OK, maybe annoying, but not boring! Um, I remember sending you this complete GEM of a card....and obviously, mine was a heartfelt rating! 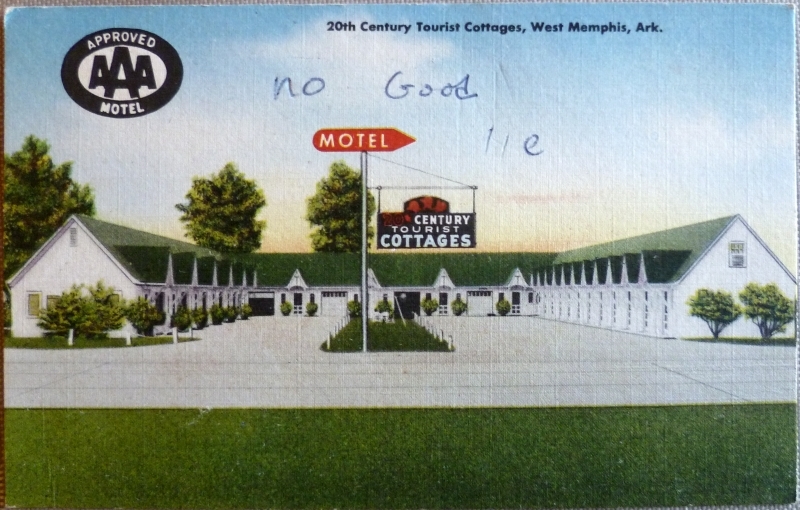 If only I could recall what offenses this motel committed! Perhaps it is best i don't recall, since we traversed the entire United States from Georgia to California via auto (sans a/c, by the way).... so this must have been truly a gruesome experience! Very touched to have made the Sunday Boring Postcard hit parade! Isn't is weird I ended up here? I'm with Anonymous. I don't think it's a photograph. I think it's the architect's pre-construction concept of what it would look like. It's so old that they have a three-digit phone number, and "20th Century" was supposed to suggest new and modern. I'm surprised they don't advertise stabling.